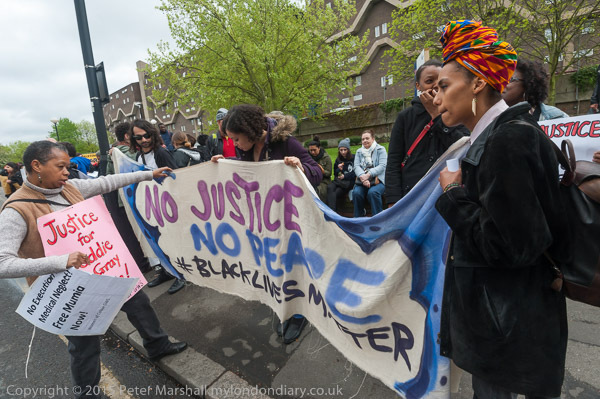 No Justice, No Peace – #BlackLivesMatter banner heads the march: Baltimore to Brixton – Black Lives Matter! 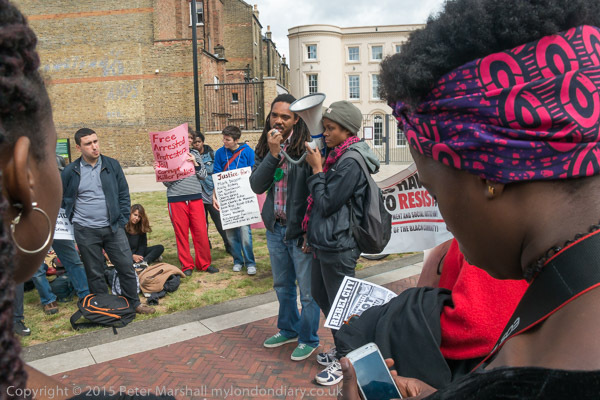 I was back in Brixton on Sunday May 2, for a march protesting after the killing of Freddie Gray in Baltimore and police attacks on his funeral. 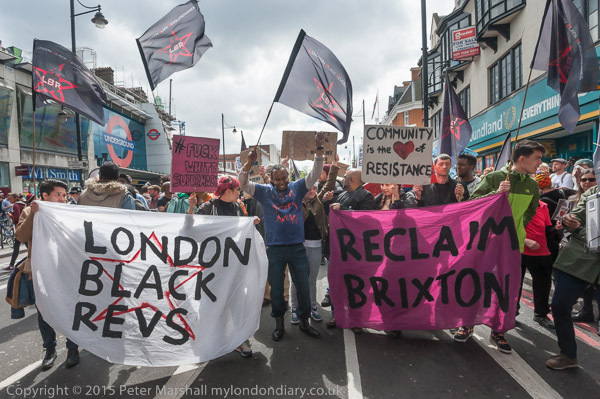 There had been huge protests in Baltimore, and others in solidarity in other cities across the USA, and this event in Brixton had been called by London Black Revs and other groups including the International People’s Democratic Uhuru Movement and Reclaim Brixton. There was also support from a number of other groups and I’d anticipated a rather larger event than it turned out. 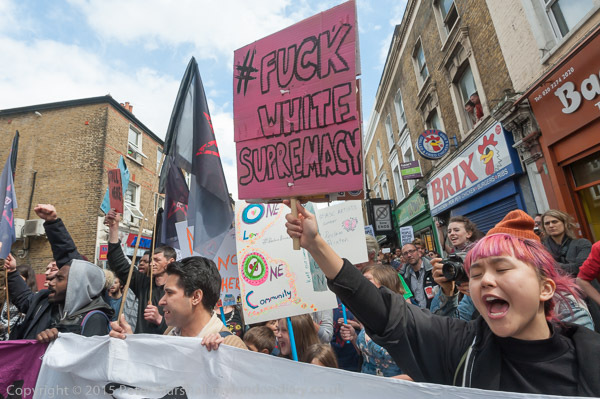 Unfortunately there seems to be a divide between the more mainstream groups and the grass roots movements when it comes to protesting over black issues, and while many on the left are rightly appalled at the events, they fail to turn out at grass-roots organised protests such as this. 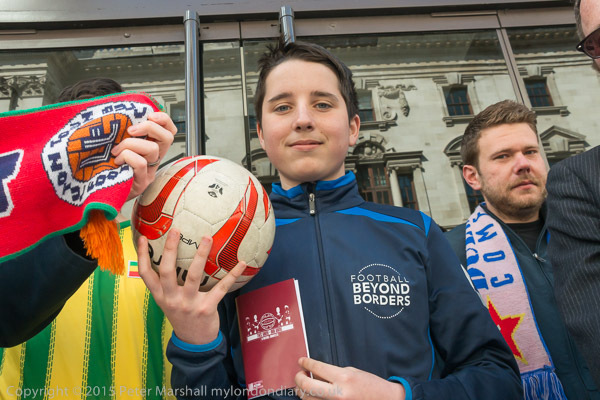 There have also been internal problems in one of the organising groups which won’t have helped. But it would be good to see the left united on black issues in particular. I arrived more or less on the dot for the protest, to find only a couple of police officers present in the area, and absolutely no-one at the address given, a property next to a street corner on Coldharbour Lane. I got out my phone and checked. Yes, I was in the right place at the right time. I walked a little way down the road and back again, meeting one woman I know who was also searching for the protest. We walked back to the meeting point and found now three students also looking for the protest. 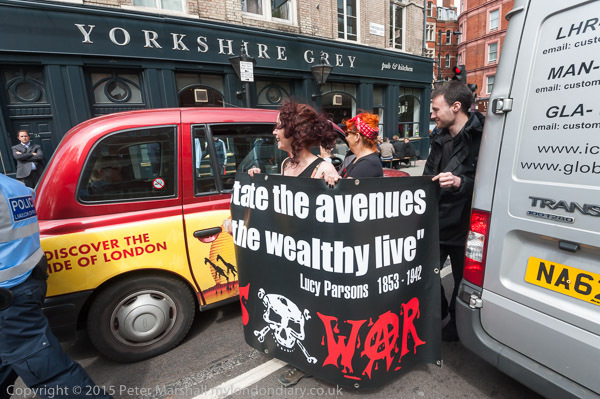 Slowly people arrived in ones and twos, and half an hour later a small crowd had arrived, icnluding a group from Class War with the Lucy Parsons banner. Still there was nothing happening, just people standing around and talking. After a little more than an hour, someone organised people to stand with their banners alongside the curb. The view from the opposite side of the road was rather distant, and I always find such things boring. A thin narrow strip of protesters, the placards and banners too distant to read, and almost half the picture empty foreground. 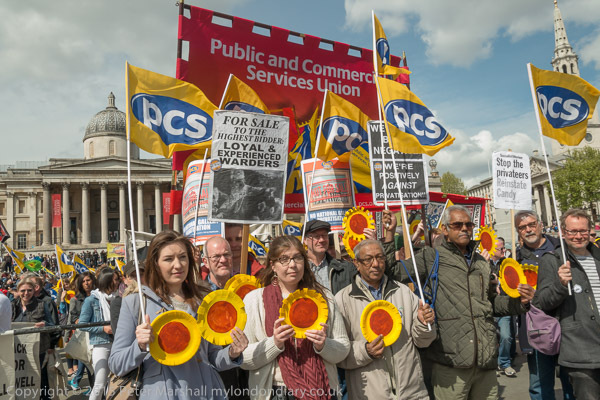 Exactly how not to photograph a protest, though if I were to send it with other images to the main agency that handles my pictures, its odds-on that some idiot editor would displace the image I’d selected as the lead image for the story with it. I moved in closer, at some risk from the traffic which was still coming along the road at times fairly densely, and tried to find something a little more dynamic. If there are banners and placards I want them to be legible, and I like a little animation. I didn’t quite manage what I was looking for, but there were several such as the above which were certainly better. Finally around 75 minutes after I arrived, the march set off, not along the road as I’d expected, but through the centre of that long block behind the people in the view from across the road, going into the Moorlands Estate through the gap in the centre of Southwyck House. The fairly narrow path here made photographing a little tricky, and I don’t think I did as well as I might; in the centre of the estate the march stopped briefly a little short of where I’d anticipated and climbed on a small raised area, and I had to jump down and rush back, perhaps missing the best of the action there. 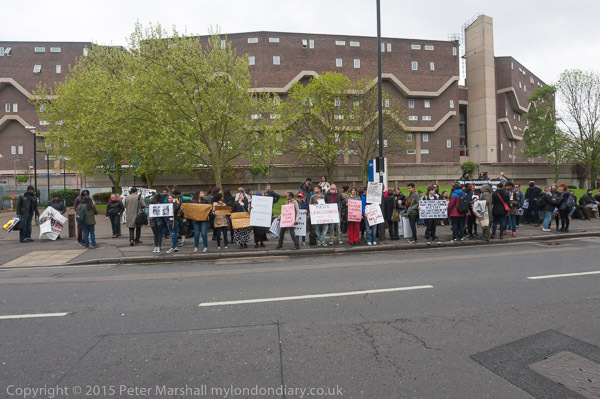 The march then came out in front of the Guinness Trust Estate, where tenants and leaseholders are fighting against eviction, and I assumed it would stop at least briefly there in support, again I was wrong-footed (and disappointed) when it turned away and marched on. It made its way back past our starting point and under the railway bridge into the centre of Brixton (top image), going on to Windrush Square for a rally. Then it was time for more marching, up on the Brixton Road through the centre of Brixton – still fairly bustling even on a Sunday afternoon. Again there was a small disappointment for me in that they marched past Brixton Police Station with its memorial tree to the victims of police killings without pause – given the nature of the event and the several speeches that had stressed the similar problems the black community has faced with police here it seemed to me an obvious target for protest – and the line of police outside showed they had come to the same conclusion. 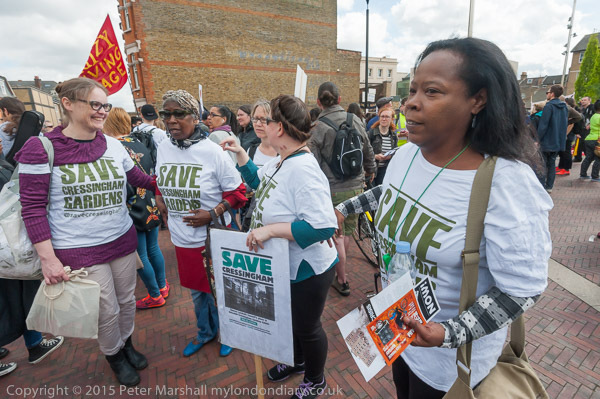 The march went on to Loughborough Rd, marching through the centre of that estate and then returning down Coldharbour Lane – past the start point again and turning down to Number Six on Somerleyton Rd, a short life former kitchen given over to the community on a temporary basis. The march was to continue from there after an interval there for rest and refreshment, but I’d had enough of walking around – we had already covered around 3 miles and left to catch a bus to Westminster, where I called in briefly at the Occupy Festival of Democracy before making my way home. 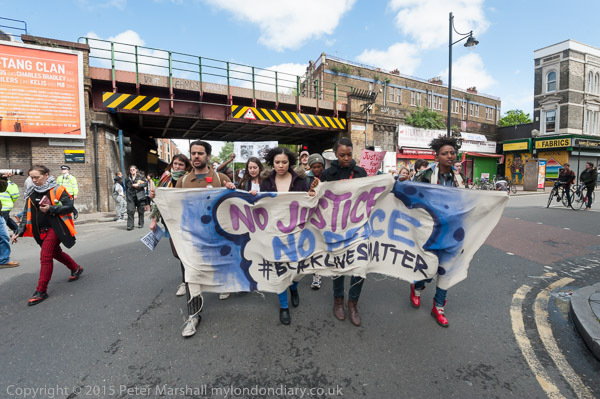 More on the march and rally at Baltimore to Brixton – Black Lives Matter! At the moment I’m living or wokring in three time zones. The real one, where I’m going out, attending events and taking pictures coming up to the end of July, My London Diary, where I’m stuggling with putting on-line the events of around a month earlier, and here, where I’m reflecting on what I was doing at the end of April. I’m moving on to May, which of course starts for me with May Day. How I used to resent having to work on May 1st, and have a silly day off on the following Monday when I was a full-time teacher. 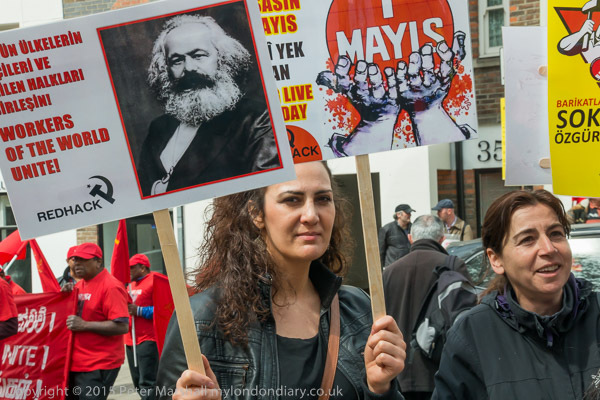 Now as a freelance I go out and work all day, but it is at events celebrating May Day. May Day starts at the civilised time of noon in Clerkenwell Green, which is then pretty red (and there isn’t much green anyway at other times, merely a slightly desolate area with traffic running through it and disused public lavatories) with the flags and uniforms of various socialist and communist groups, particularly from London’s Turkish and Kurdish communities. Also present are various trade union branches at the front of the march with their banners and lurking towards the back some lively anti-capitalist and anarchist groups. 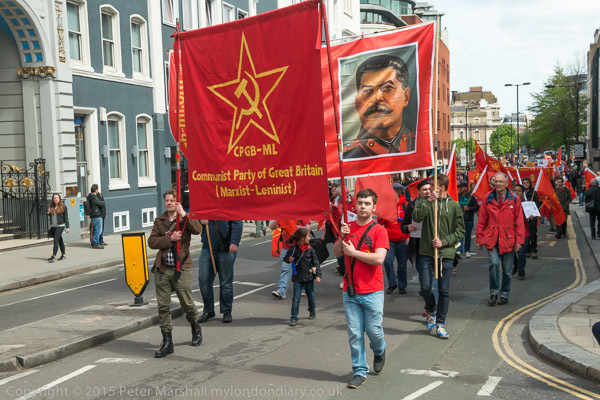 And there are a few of the usual banners with large portraits of Stalin, that always make me shudder a little – and he also appears rather smaller in the communist pantheons that adorn some of the other banners in the procession. 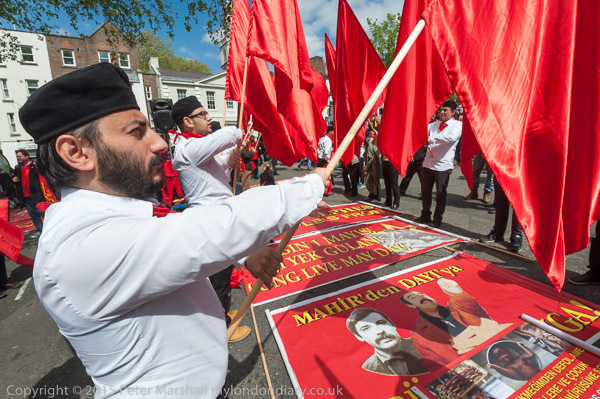 The march itself, generally a rather sedate parade along one side of the road, was enlivened by the anarchists, who decided to march along the other side where traffic was still flowing with their banners ‘Democracy is Dead‘ and ‘Rise. Riot. 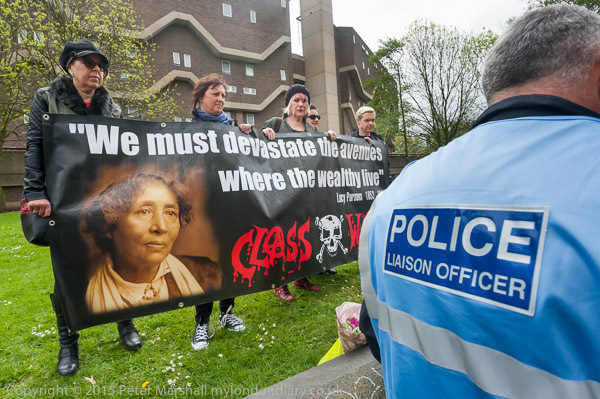 Revolt!‘ as well as Class War’s ‘Lucy Parsons‘ banner, all of which led to a little friction with the police – and to one of the marchers producing a banner out of her bag with an rather terse response. The rally in Trafalgar Square tends to the tedious, and there was a little of that, but with a long-running industrial dispute over privatisation taking place at the National Gallery overlooking the square, there was at least something of interest. 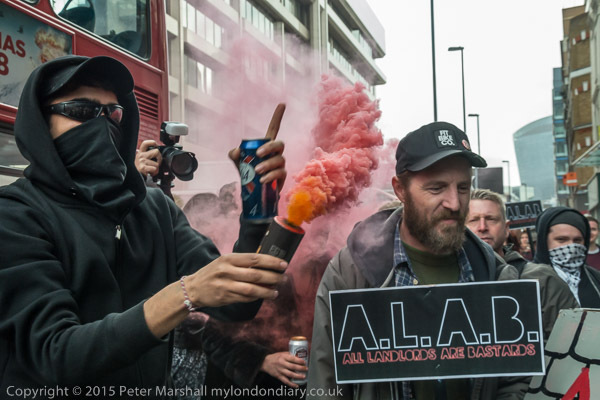 I had to leave before the end of the rally, to cover an unadvertised event by Class War and other anti-capitalist protesters, who hoped to block several of London’s Bridges in a coordinated protest over housing & education cuts. 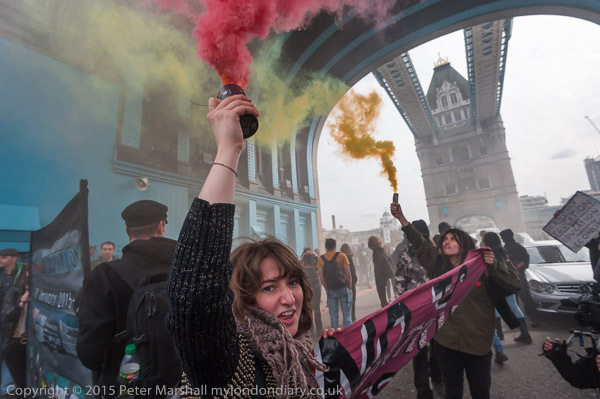 In the end, only the protest on Tower Bridge that I was photographing took place. Class War had their own event an hour or so later, an “epic street party” outside One Commercial Street, a May Day Party at ‘Poor Doors’, or rather outside the door only the rich are allowed to use to the flats in this tower block. By the time the party decided to take to the streets and march back to Tower Bridge for another protest I’d had enough and took the tube on my way home. I’d been on my feet and taking pictures for too long and needed to rest. Frank was hired by the Stones to make a documentary film about their 1972 American Tour and did so in cinéma vérité mode, with those taking part in the backstage antics being invited to pick up cameras and add to the record. They did so too well, providing a revealing view that led to the Stones getting a court order to prevent the release of the film; although in recognition of the rights of Frank as an artist it can be publicly shown if Frank himself if present. I can’t sign up to Charlie Finch’s opinion in Sockcumber Blues on Artnet when he says that rather than ‘The Americans’, “Frank’s true masterpiece is his still unreleased chronicle of the Rolling Stones’ 1972 American tour”, but it is a film that should be seen. And ‘The Americans‘ is certainly a book every photographer should own and study, still ‘The Book That Changed Photography‘. But I’m sure I’m preaching to the converted. While trying to find out more about the ‘Rocks Off’ video I came across a fascinating article by Bob Egan on Pop Spots NYC researching the location of photographs of Bob Dylan taken by New York musician/photographer John Cohen, who was a neighbour of Robert Frank who lived at 34 Third Avenue – and around three quarters of the way down the very long post he includes a photo of the relevant page of the NY reverse street directory showing both of them. There are also links to ‘Rocks Off’ and also mentions another of Frank’s films, Pull My Daisy, as well as more that may be of interest to fans (like me) of Jack Kerouac, who of course wrote the fine introduction to the US publication of ‘The Americans‘. Elsewhere in various forums on the web you can glean more information about the film locations in ‘Rock Off’ video. The guy dancing on the street as he dodges traffic to wipe car windows is apparently at the corner of Houston and Bowery in New York, and the rest of the New York street scenes are in that area (including Lafayette), while Mick Jagger is shown outside the Galway Theatre at 514 South Main Street in Los Angeles, an ‘adult’ theatre that has apparently appeared in a number of films. 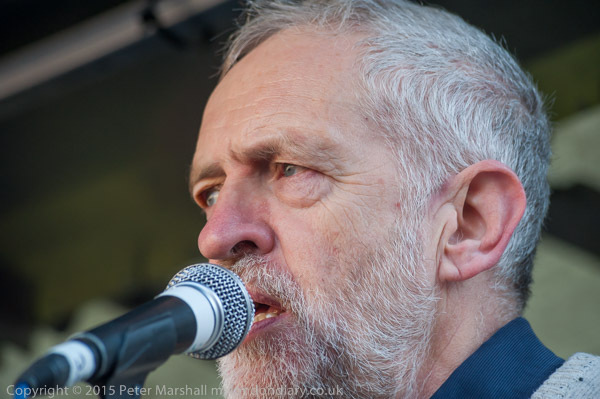 I’ve long ago lost count of the number of occasions on which I’ve photographed Jeremy Corbyn, and listened to him speaking. He’s an unusually good speaker, logical and clear, and even though I’m concentrating on his gestures and expressions I can usually also follow what he is saying. And often, though not always, I find myself agreeing. If you have been relying on the mass media for your opinion of him, you will think of him as being some kind of left-wing extremist, but I think you would be mistaken. Jeremy is a liberal, perhaps a left-leaning liberal, but one who most of my left-wing friends decry as a woolly liberal. 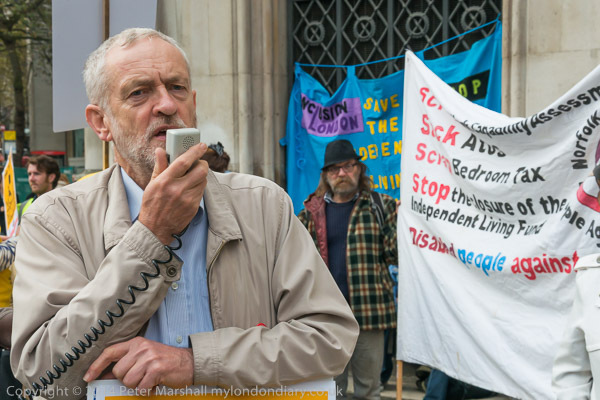 Islington man is nothing like radical enough for them, lacking the support for the deep structural and economic changes they feel are needed to move the country towards true equality and justice. I’m not a member of the Labour Party. I was as a student, but they threw us all out and I’ve never quite felt it worth going back to since. 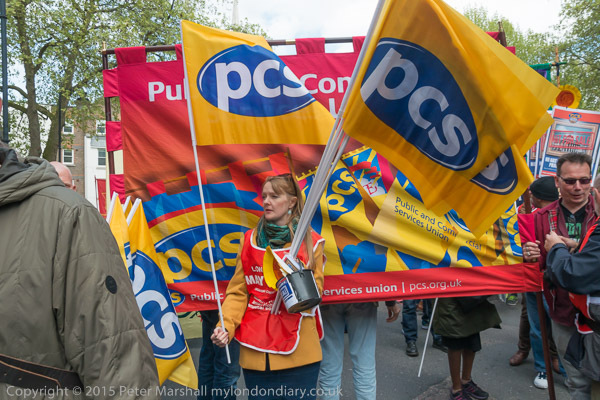 I do belong to two trade unions and am an active member of one, the NUJ, at least occasionally attending branch meetings and making my views heard. Until recently I used to vote Labour, solidly Labour, but I haven’t done so in recent elections. So I’m precisely one of those voters the Labour party needs to win back, though perhaps not a typical one, and my constituency is in any case one of the safest Tory seats in the country. The only one of the four candidates I can envision doing so is Jeremy. Partly it’s because of his policies and those speeches, but mainly I think because he really isn’t a politician. He’s far too honest and sticks up for his principles; conviction rather than convenience. He’s a man I would trust to leave holding my bike and know it would still be there when I came back and not sold or left unguarded. And I would trust him with our NHS knowing it wouldn’t get privatised while he was busily assuring everyone it was safe in his hands. Photographically Jeremy can present a problem. A while back I got an e-mail from a young photographer I know asking how I managed to photograph him with his eyes open. He does have a tendency (and I suffer from it too) to close his eyes when speaking in public, and I think is more sensitive than most to bright light. Often you simply have to keep your eye fixed for the moment when his eyes open and react immediately before they close again. That one click zooming in preview mode is vital (its the top of the top ten Nikon customisations in SLR Lounge if you are a Nikon user and don’t know what I’m talking about) so you immediately know if you were fast enough. 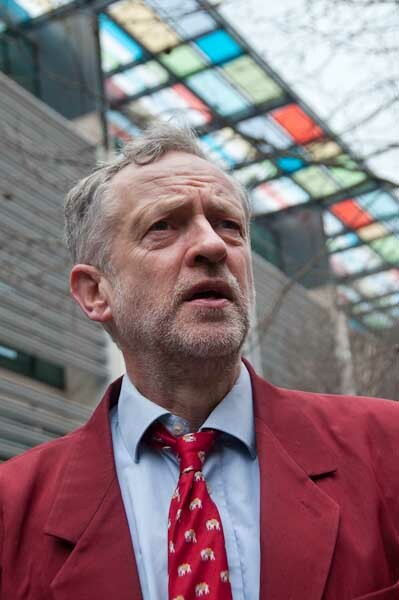 Another reason I warm to Jeremy is that clearly he doesn’t take a great deal of thought about how he looks. Most politicians you feel spend rather too long looking at themselves in mirrors, and employing people to improve their ‘image’. I rather prefer the more natural look to the highly manicured. The pictures of him that I’ve put in this piece are more or less random images from over the years from My London Diary. I used the search feature on that site (top right of page) and typed in ‘Corbyn’, finding 128 items and then clicked on the first few of them. 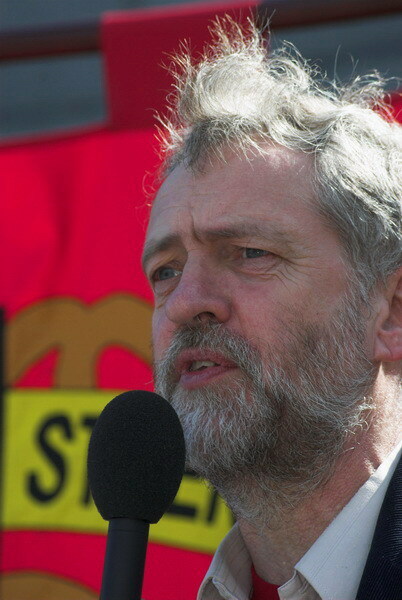 Most of those 128 pages will include pictures of Jeremy, though I have taken just a few of his brother Piers Corbyn. But those here are really a fairly random selection of the pictures I’ve taken of him over the years. 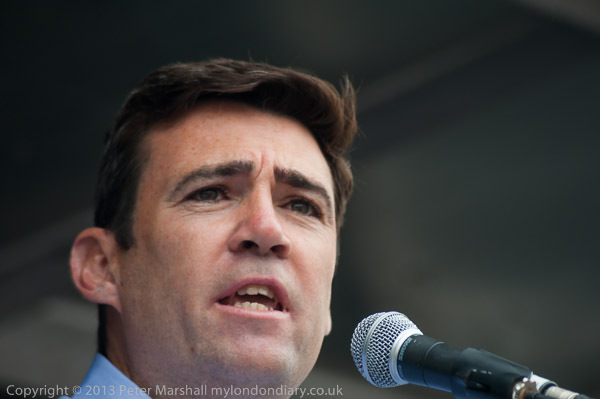 I’ve also a few times photographed Andy Burnham, at the extreme left in the above picture, who would I suppose be my second choice, though I suspect he wouldn’t deliver a Labour party I’d ever vote for. 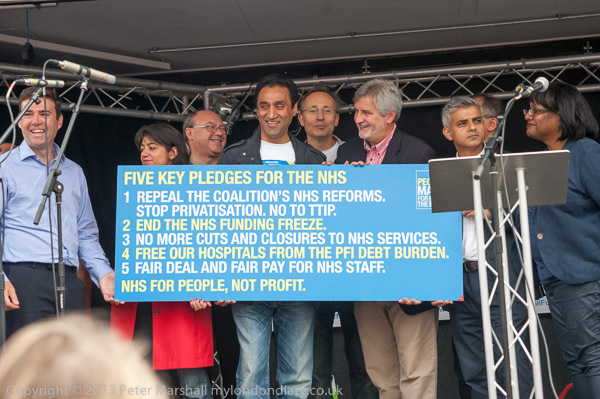 He came I felt somewhat reluctantly onto the stage where other MPs were surrounding a doctor holding the ‘Five Key Pledges for the NHS‘ at the rally ending the People’s March from Jarrow for NHS in 2014. As I took the picture with him standing a little to one side I couldn’t help wondering whether if the support he was expressing as Shadow Secretary of State for Health would be quite as whole-hearted if he got the real job of being in charge of the NHS. It isn’t a good picture – those microphones were in the way, but I took quite a few more of him at the event both with other protesters and speaking. I won’t be voting in the election, but will be interested in the result, which the opinion polls seem to indicate will be closer than anyone expected. It would be good to see a future for Labour as a real opposition to the Tories rather than a Blairite Tory-lite. The final weekend of April was dominated for me by housing and the related issue of gentrification and regeneration. Housing has always been tight in London, particularly for those will little money, and it’s something that has always been an issue. In the Victorian era, philanthropists set up various housing associations and companies to provide housing of a decent standard for the poor and tore down many of the worst slums to build large blocks of flats. It wasn’t always if ever a fair or comfortable process for those whose slums were demolished, many of whom found themselves out on the streets and had to squeeze themselves into the already overcrowded slums adjacent to the new blocks, but it did provide a great deal of decent living space for the working poor who moved into the new buildings. And there was no doubt that the intentions of those driving the process was good, even if they did also want to provide a sensible return for investors who financed some of the schemes. In the first three-quarters of the twentieth century, the London County Council and the local councils across London took up the challenge of providing decent low cost housing for Londoners who needed to live in the capital where they worked. Many small and large estates were developed across London, as well as new areas on the outskirts and later new towns outside of London. Private developers too built huge estates mainly in the outer suburbs for the middle classes who could commute to work by train and increasingly by car. Huge numbers of housing units were provided at costs which London’s workers could afford, although councils still had long waiting lists of people living in poor or cramped accommodation who wanted to move into council property. In the last quarter of the twentieth century, things began to go spectacularly wrong. Thatcher’s ‘Right to Buy’ was one of the the first straws, and while providing a huge bonus for the lucky few who got their property at a knock-down price (though many could not afford to keep it long), it was not matched by any attempt to replace the low-cost housing that was taken out of council hands. Other measures actually took most of the housing out of council hands and created housing associations, which in the longer term have also been a disaster for the poor. The final straw has become the building of properties in London simply as investment vehicles for overseas buyers. I don’t think any solution to the crisis can be found unless this is very severely curbed in some way, perhaps by a punitive tax on sales by or on behalf of overseas residents. Regeneration programmes were perhaps brought in by the Labour government with good intentions, but if so these have now been subordinated to profit and greed. Labour councils, realising the huge financial potential of their large well-located council estates for redevelopment began to ‘decant’ those living in prime sites so that they could be developed for private and overseas sale at much higher densities than the well-planned estates that are being demolished. Increasingly developers of these sites are finding ways to avoid meeting any need to include social housing in their redevelopment, with councils (who are mainly under Labour control) conspiring to help them do so. Gentrification involves more than this, but the cost of housing is a major part in this, along with the changing nature of employment, and of changes in culture. The people who live in ‘up and coming’ areas of London bear the brunt of the process, getting priced out of the market, decanted from council and housing association properties, usually moved well out of the area and away from jobs and friends, and often having to move into private rented property with little or no security and high and increasing cost. 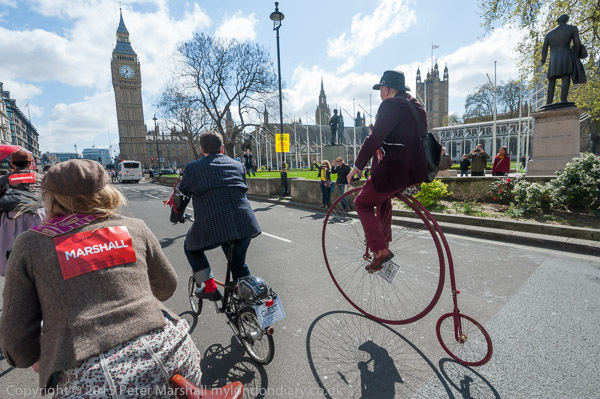 Areas such as Brixton and the Elephant in south London are under particularly high stress, in part because they have long been unfashionable with historically low house prices (for London) but also because of their location, close to the centre of London with excellent transport links. 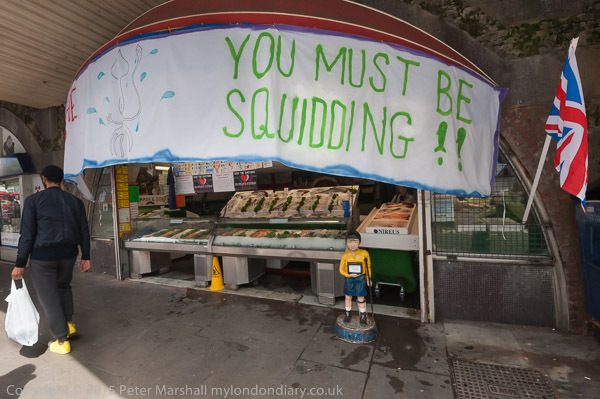 Brixton has the added attraction of a particularly vibrant culture, mainly based around exactly those people and businesses that are now finding they can no longer afford to live there. The railways run through the centre of Brixton, with Atlantic Road alongside the rail arches and above it Brixton Station. Around the corner a few yards away on the Brixton Road are the underground station and bus stops for the many routes that make Brixton something of a bus hub. At right angles in its centre is Electric Avenue with its incredible street market – and the market also extends in the other direction to the north of the railway lines with more small businesses in the arches there. Running from Atlantic Road to Coldharbour Lane are the arcades of ‘Brixton Village’, increasingly catering for the new, young middle-class that are beginning to take over the area, and there are other arcades to the south as yet less affected. It’s a unique centre in London, and I can think of nothing like it elsewhere in this country. I’ve been going there occasionally for years, at first to buy cut-price photographic materials – outdated bulk film and paper – and later to Photofusion, where I put pictures in their library and went to exhibition openings. Surrounding the centre are some areas of Victorian terraces, but also huge housing estates built by the London County Council and local councils, as well as some by the philanthropic housing companies. All these are now under threat, as all could be demolished and rebuilt at higher densities for sale at huge profits. Most of the properties are in reasonable condition, built to higher standards in many respects, particularly size, than new properties, though often in need of some refurbishment. Typically this might cost £15,000 per property, while building a new council flat costs perhaps £350,000. But flatten the site, build twice as many flats and sell them at market price, perhaps £600,000 gives considerable margin. Reclaim Brixton brought together many different groups who see their lives and their culture at risk. The small businesses in the railway arches and arcades, currently threatened by huge rent hikes from the owners Network Rail which will put them out of business. A number have been there more or less since the war, and at least one for longer, but they can’t afford to pay three times their current rent. People living in private rented property where rents keep rising and rooms are getting harder and harder to find. 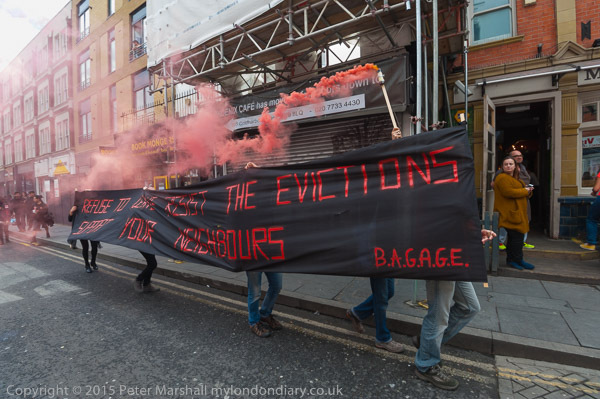 People from housing estates currently under threat of eviction, including Cressingham Gardens and the Guinness Trust Estate, as well as supporters from similar campaigns from around London. And many Brixton residents who see the aspects of the area they love – particularly pubs, cafes, shops and small businesses – being replaced by those catering for the new richer residents moving in to the area. Much of Brixton’s vitality comes from the high proportion of people who came to live there from the West Indies, moving to Brixton as many from the early arrivals were given temporary housing in the area and they found jobs from the Brixton Labour exchange. It became an area where Africans and West Indians felt more welcome than much of London and the black population grew, opening shops and businesses there. The vitality of the area along with cheap rents (and squats) attracted others too, both black and white, including many young artists and musicians, some of whom have now grown old there. 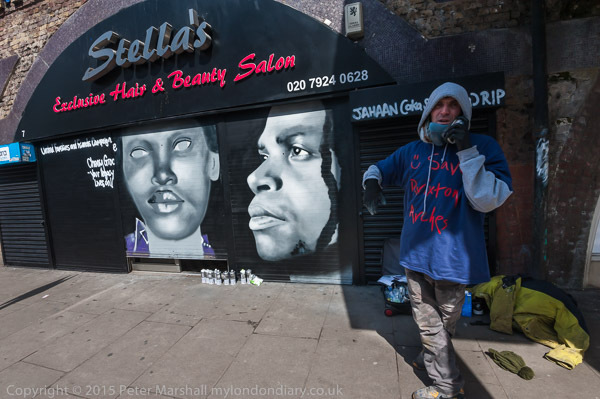 A mural on a shop front in Brixton Arches with images of Cherry Groce and Sean Rigg, just two of those killed by police in Brixton. It’s hard to understand the events there both on this Saturday and in the past without knowing the background – and there is much more than I’ve written above, particularly for example about the relationship with the police and events such as the ‘Brixton Riots‘ and the various deaths in police custody in the area. I divided my coverage of the Saturday into four stories, though they are all part of the same story. There should have been another couple of stories, but I went home early. As I stood at the bus stop I thought I would almost certainly miss things happening, but I was tired, and decided that plenty of others were present who would record them. I keep telling myself that I can’t do everything and sometimes at least have to admit my age. So I went home, fully expecting that things would kick off, that there would be some at least minor friction between protesters, police and authority that was likely to make the headlines, while most of what led up to this and I had covered would somehow not be news. 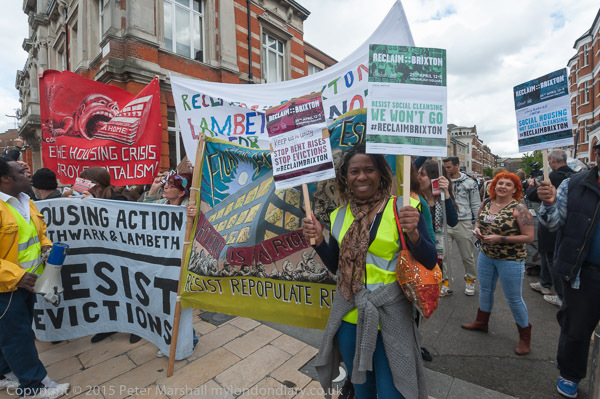 What did happen – a short-lived occupation of the Lambeth council offices and the breaking of the windows of the most notorious estate agents – was actually rather less than I had expected. 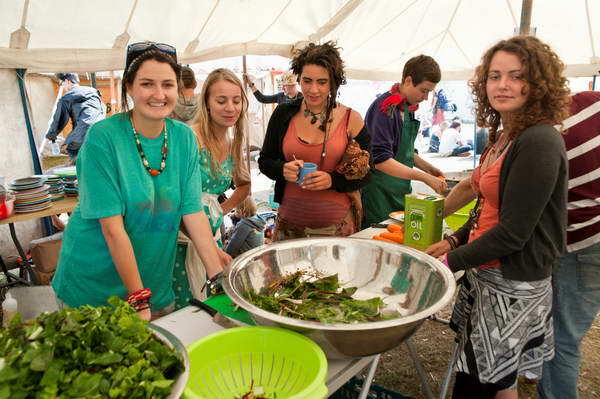 Reclaim Brixton celebrates Brixton, an organised static event in Windrush Square at the centre of the protest with various groups setting up stalls, making speeches in different areas. In another interesting interview on Vantage, Why We Make Photographs, originally published on the blog of Blink, Kyla Woods talks to photographer and picture editor Maggie Steber about her own work, what she looks for in the photography of others and about styles and changes in documentary photography. It’s an interesting and at times thought-provoking article (though if I stop much to write about it I will miss my train), illustrated by images of Steber’s work, many of which are also in the “greatest hits” section of her web site. I think it is rather more satisfying to look at her images in the the other sections of the site, particularly Portraits, Haiti, Madje Has Dementia, Native Americans and Dark Side, where many of these images are shown in their contexts. It perhaps reflects a difference in our attitudes, but I rather dislike the idea of “greatest hits”. Its also interesting to read about the film she made, Rite of Passage, about the final years of life of her mother Madje Steber. Maggie, born in Electra,Texas in 1949 was an only child, bought up by her mother living as a single parent, having divorced when Maggie was only six months old. In her teenage years, there relationship was often strained and Maggie left home “to seek her fortune” in New York at the age of 21. But the two were the only family each had, and in the Time Lightbox article she says “She would never let me photograph her before. When her defenses were down—and I’m sure some people will say that’s not right—I started photographing her.” Originally begun as a purely personal project, the photographs have become a moving record of their relationship and the human condition. It doesn’t I think do anything that you can’t actually do in Lightroom itself, using the metadata filter in the Library view, and I think it will only do its magic on the catalogue as a whole. You can see the kind of information it supplies in the demonstration on the web site. Unfortunately, a small note at the bottom of the application page reads: July 15th UPDATE – It appears as though large catalog files at 2GB and above are having problems loading. We’re looking into this issue and they are correct. Attempting to load the smallest catalog I could find – my current one I started on January 1 this year – immediately crashed my browser. The Library module at the top of the Catalog section tells me that it has only 52,235 pictures in it, pressing the \ key brings up the Library filter, and I can look at the figures, filtering by Text, Attribute or Metadata. I’ve managed to produce these using only 5 cameras and 13 lenses, the most exotic of which was the 0.0mm f0.0 which apparently managed to take two perfectly decent images on my Nikon D700! Another oddity was the ‘Unknown’ lens which produced 90 pictures on the Fuji X-T1, while revealing its identity for another 230 as the XF 35mm f1.4. Lightroom – with the help again of my calculator, reveals that I made 46% of those exposures with the D700 and 44% with the D800E, and a virtually equal number with the 16-35mm and 18-105mm – both at 41% of the frame count. My favourite lens is really still the 16mm fisheye, but there are far fewer situations where that is appropriate, and it accounted for only a little under 4% of exposures. Lightroom Dashboard is a nice idea and great for the light user of cameras, and I hope it’s possible to fix the large files problem. It would have been good to see some nice graphs, pie charts etc, but the information is all there in Lightroom if you need it. And in Lightroom you get to see exactly which exposures you used that f0.0 lens for! The actual question was “Do You Always Get Permission From People That You Photograph?” and you can read the responses from all 18, together with links to their work on the web so you can see the kind of work they produce. As several of them make clear this is of course a vital context for the question. Do I ask? Sometimes. Mostly I don’t because there is no need to, as there is an implied permission in the situation. 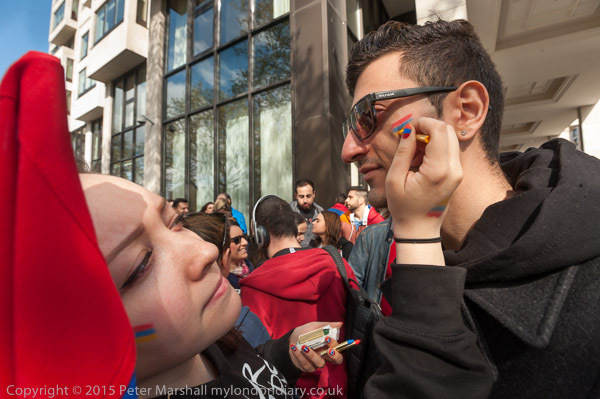 People in general take part in protests to gain publicity for a cause and are pleased that you take an interest and want to photograph them. Or they are at other events where being photographed is a part of taking part. Of course there are exceptions. 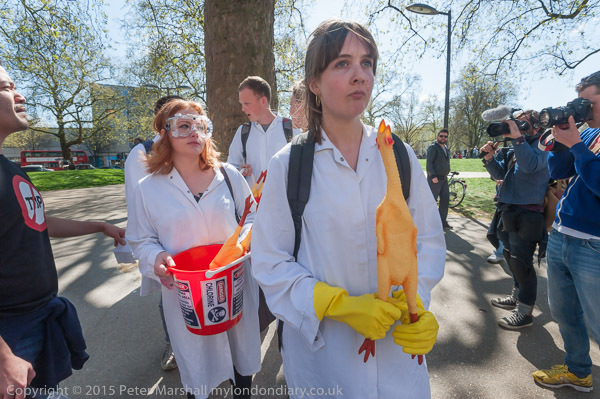 Occasionally people at protests will tell me they don’t want to be photographed or will hide behind a placard when I raise a camera in their direction. If they do so, usually I simply don’t take a picture, as most often their face would have been a vital part of the image. Though in most cases they will actually appear in other photographs I’ve taken of the event. If anyone actually objects to my photographing them, I have to take their objection seriously, though it won’t necessarily stop me taking a picture or deleting an image I have already taken. 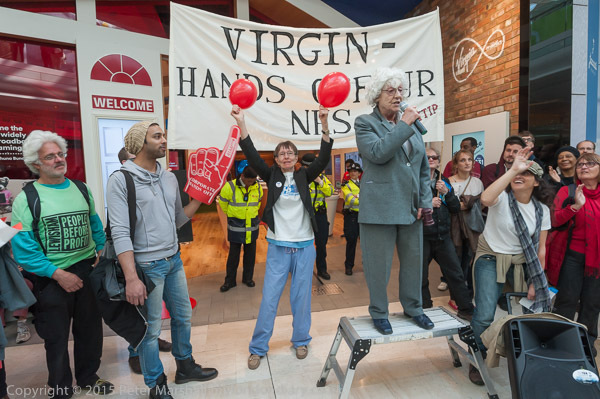 I ask myself a question – is there a genuine public interest in taking this photograph? And try to answer it as honestly as I can. With protests, people who don’t want their faces shown have a simple option – to wear a mask of some sort. Police may occasionally instruct people to remove masks (although they now appear to have conceded that people may do so – and the police are also often masked) but photographers never do. Masks add a certain mystery and that’s always a good thing in a photograph. 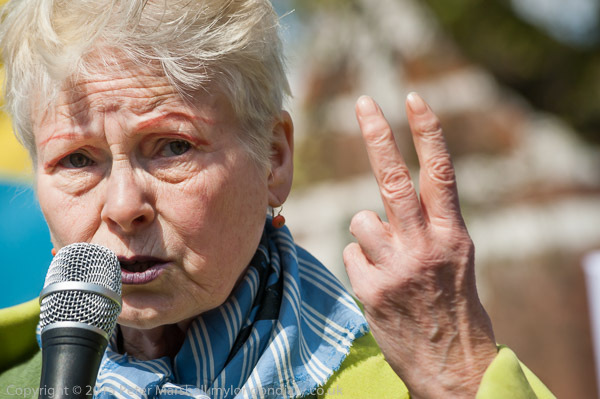 Even at protests I’ll often ask if I can photograph someone, often just by gesture, but only when I want to make something that is more a portrait of them rather than an image showing the action. Its more a matter of getting their attention rather than their permission, and is usually the most I do to direct the people I’m photographing,though just occasionally I will ask someone to look at the camera – particularly these days when so many spend almost all their time looking at their phones. Do the people I am photographing have a reasonable expectation of privacy – or would my picture be an unreasonable intrusion? Would my taking a picture without asking upset or disturb them? Is there a good artistic reason for taking an image without consent? Or for asking if I may take a photograph? But if you are not sure, take the picture. As one one my friends commented on line when Tony Olmos posted a link to the Feature Shoot article this morning on Facebook, “I’d always rather give an apology than lose a picture.” Spot on David Hoffman. It also depends on usage – whether the photograph is for commercial, editorial or artistic purpose. When some Magnum street photographers photographed for commercial use I understand they were accompanied by a team of supporters with pads of model release forms, while for editorial or artistic work these are seldom if ever needed. I can probably count on the fingers of one hand the number of model releases I have bothered to obtain over the years. Two hands at most. 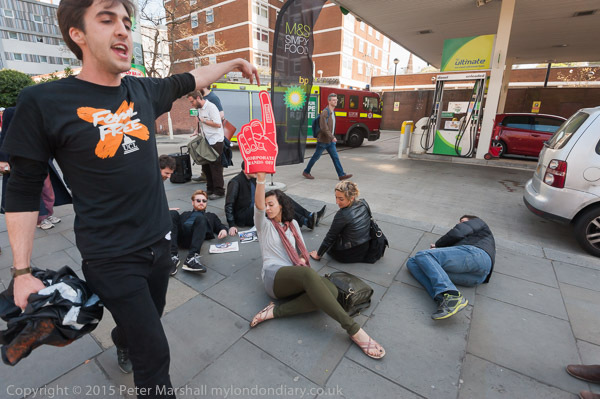 One of the most difficult places from this aspect that I’ve worked in was Climate Camp. I’d more or less avoided it in earlier years simply because of their ‘Photography Policy‘ (and in 2007 had been prevented by police from getting there), but in 2009 was persuaded by the late Mike Russell, perhaps better known as ‘Mini Mouse’, who organised the media coverage of Climate Camp, to go and photograph officially – and I was issued with a sash denoting me as an official photographer. Despite this there were still people who objected to being photographed through some misguided idea about their human rights. It was an attitude that had a negative influence on my own work over many years from the late 70s on. Get over it, if you are in public, you are in public. I’m not sure what I think about the various prize competitions we now have in photography. Often they seem to be rather unfair, and I was certainly heartened to hear the winner of one literary prize being interviewed on Radio 4 recently who had decided to share the large cash award equally with the other short-listed writers, whose work he said was equally deserving. I find I often don’t agree with the judges in photographic competitions, and things are seldom so clear that I don’t feel a different and equally qualified panel would have come to a different verdict. Ilit Azoulay (Israel); Valérie Belin (France); Matthew Brandt (USA); Maxim Dondyuk (Ukraine); Alixandra Fazzina (UK); Ori Gersht (Israel); John Gossage (USA); Pieter Hugo (South Africa); Gideon Mendel (South Africa); Sophie Ristelhueber (France); Brent Stirton (South Africa); Yang Yongliang (China). It’s perhaps a surprising that the photographers come form only seven countries, with three South Africans and two each from France, Israel and the USA. In the PDN article there is an image by each of them and in all but one case a link to their work on the web. The Prix Pictet link currently only has a couple of pictures by each of them on its ‘Portfolios’ page. The series ‘Eleven Blowups’, images of bomb craters by Sophie Ristelhueber was a part of the work that won her the 2010 Deutsche Borse Photography prize at the London Photographers’ Gallery. As the article from the Daily Telegraph explains, these were not pictures of real craters, but computer simulations of bomb craters based on images by other photographers, and using “details of her own pictures of rocks and stones that she had shot in Syria, Turkmenistan, Palestine and the West Bank.” Not my kind of photography. There are others whose work I don’t have a great deal of sympathy with as well, but also some truly moving and impressive work. I was fortunate to see Gideon Mendel talking and showing work at a meeting in London a few months ago from his ‘Drowning World‘ which includes a series of portraits of flood victims, including one taken around a mile from where I live as well as others around the world. I’ll leave you to discover the other great work for yourselves from the links in the PDN article. There are four or five among the dozen who I think deserve the first prize! As well as the monetary prize, there is also a commission awarded “in which a nominated photographer is invited to undertake a field trip to a region where Pictet is supporting a sustainability project.” The short-listed work will be shown in Paris at the Musée d’Art Moderne da la Ville de Paris and the winners announced in November 2015. You are currently browsing the Re-photo blog archives for July, 2015.